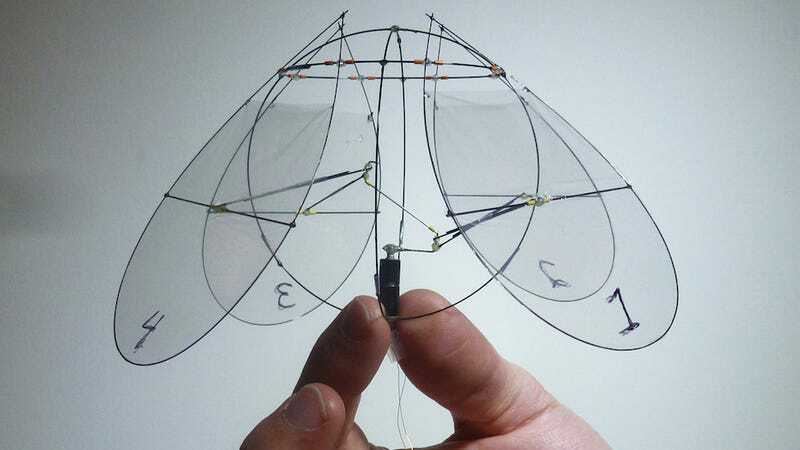 Small flying robots often take design cues from the flapping wings of insects and birds. But this robot prototype, pictured above, doesn't move like any wind-loving creature here on Earth — instead, it flies like the jellyfish swims. And the story of its invention is pretty weird. Watch a spherical robot drone fly around the room! The "flying jellyfish" wasn't actually designed after those infamous denizens of the sea. "It has a kind of tangled history," explained Leif Ristroph, a mathematician and physicist at New York University, and co-author of a new study describing the winged contraption. "It started with bizarre experiments on 'paper bugs.'" Researchers were initially conducting experiments on small cone- and pyramid-shaped bodies that they placed in a wind tunnel. In effect, they were mimicking the flapping flight of insects and birds by having the paper constructs hover in airflow that oscillated between blowing up and blowing down, Ristroph told io9. By doing this, they found that the paper bugs were quite stable — if they started to tilt, they automatically righted themselves just by the motion of their wings. "This is a nice feature to have in any flying machine," he said. To keep upright, birds and insects have sensory-motor systems that detect when they've been knocked off course. That is, they're actively sensing the environment and modulating their flight forces. When scientists build robots to mimic the motion of these flying animals, they have to incorporate similar feedback control systems, or incorporate tails or sails that can dampen or shift the aerodynamic forces at work. But these additions make the design of the robots more complicated. "We wanted to try to avoid that and come up with a simpler design that keeps the robots upright just by flapping wings," Ristroph said. From the paper bugs, the researchers envisioned a flying machine that's similar to an umbrella, and can generate lift by opening and closing. What they came up with something more akin to a flying jellyfish. Unlike a jellyfish (or umbrella), the robot doesn't have a continuous membrane. Rather, it has four 8-centimeter-long Mylar wings. A small motor, which is connected to an external power source via a wire, pulls in and pushes out the wings as it rotates. And, well, that's about it. The small robot, which weights 2.1 grams, flies by opening and closing its wings, in a motion that similar to a jellyfish's. The way that it generates lift is likely the similar to the way a jellyfish generates its propulsion, Ristroph said. "The basic scheme for both, I think, is to draw in the fluid (air or water) into the volume between the wings or membrane, and then squirt that fluid outward or downward," he said. "At this point, we don't completely understand the aerodynamics." In their tests using high-speed video cameras, Ristroph and his colleague Stephen Childress found that the body orientation of the flying jellyfish is stable during ascending, forward and hovering flight modes. While hovering, it assumes an erratic flight path in a small area, not unlike the fluttering flight of a moth. Whenever it experiences a large tilt, the flapping of its wings allows it to naturally recover. Given that the flying jellyfish is still an early prototype, it has its limitations. For one, it cannot be controlled on the fly. The researchers can change the way the robot flies or give it more lift, but this has to be done before the jelly is turned on. The device is also tied to an external power source — the team is now looking into implementing an onboard battery. The robot's very simple design and natural stability is promising, Ristroph said, because it allows for easy miniaturization. Once the design is finalized, the researchers should be able to fabricate really tiny flying robots that have all the simplicity and stability of the larger versions. Aside from obvious surveillance and military applications, Ristroph thinks the flying jellyfish could someday be used for search and rescue missions in collapsed buildings and such. They could also be used for monitoring and sensing purposes. "I like to imagine that you make hundreds of the flyers and throw them out above New York City to test air quality and other things," he said. But there's still one big issue to figure out: The robot's name. "We haven't really dubbed it yet, so we usually call it the 'flying jellyfish,'" Ristroph said. "But I like the name 'AeroJelly.' That would be cool." Check out the study over in the Journal of the Royal Society Interface. All media via Leif Ristroph.